Do you have any idea about the Marvel Machine returning? The Marvel Machine is a game which allows you to play for in-game equipment and Cash Shop items on the MapleStory website. The Marvel Ambassadors have searched far and wide for the most intriguing, attractive, and powerful items in existence, and now they’re passing these relics on to you. 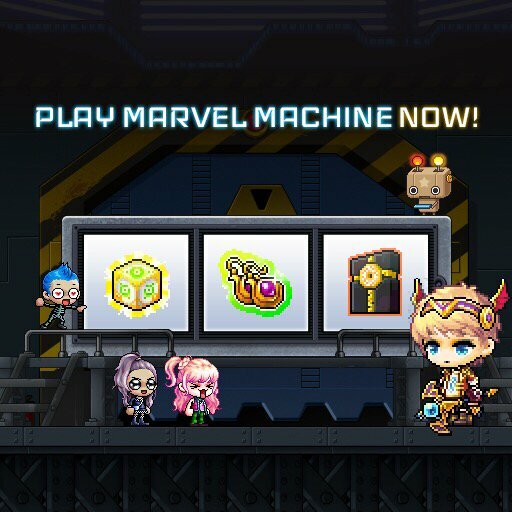 During the event period, purchase spins for the Marvel Machine on the MapleStory website and receive three random prizes for each spin you use! NOTE: Marvel Machine codes can only be redeemed in non-Reboot worlds. The Marvel Machine is here! What really excited is three prizes for every spin! The Marvel Machine is stocked full of the most intriguing, attractive, and powerful items in existence, so what are you waiting for?